My telephone rang one afternoon the end of July, and the voice on the line said words that make a writer’s knees buckle. Fortunately, I was sitting down. “We love your book,” said Leslie Browning, publisher of Homebound Publications. I’d expected to wait a couple of months to learn if Homebound was interested in my manuscript, but Leslie wrote within 24 hours that she wanted to read the entire work. My knees buckled again as I submitted all 245 pages. The automated response from the submission managing program Homebound (and many other publishers) uses reiterated the press’s usual response time: 12 to14 weeks to review a full manuscript. Since I’d heard from Leslie sooner than the typical eight-week wait with an initial query, I hoped a decision about the manuscript might come quickly. While I waited, I reviewed the Homebound website—again. And again. And with each visit, I felt more convinced that this press was a perfect fit for my manuscript, and for me. Homebound Publications is an award-winning independent publisher founded in 2011. Its name, derived from the idea of the journey to find a place of belonging, echoes a Herman Melville quote—“Life’s a voyage that’s homeward bound.” The press receives about 2000 submissions a year and publishes 8 to 12 full-length works of contemplative literature annually. In this throwaway-culture where we buy a book in the supermarket, read it over the weekend, and then toss it, we publish books that you will have on your nightstand for a few years and return to again and again—books that nourish your mind and soul. While I awaited Leslie’s response to the manuscript, I purchased two titles Homebound has published—Match by Gunilla Norris and Seasons of Contemplation by Leslie Browning. Yes, this publisher is a poet, too, and all of the editors are working writers. The books were as beautiful as the images in Homebound’s online catalog, and the content was equally rich with wisdom to keep me grounded as I awaited Leslie’s response. It came in an email about ten weeks later, full of enthusiasm for the memoir and an explanation that Leslie’s schedule had been packed. We made a phone date to talk further. I caught my breath after Leslie’s first words on the call. For the next hour, we discussed what it would mean for Homebound to publish Hiking Naked. The press seeks passionate, dedicated authors who understand both the art and business of writing. As writers themselves, the Homebound staff respect an author’s voice and involve her in the book’s design process. The longer we talked, the clearer I became that I wanted to work with this press—and Homebound wanted to work with me. “Do you have any more questions at this point?” Leslie asked. I smiled as Leslie went on to explain that she’d send me a contract to review. It arrived a couple of days later; I considered it carefully and sought guidance from a lawyer and other writers who’ve worked with small presses. Leslie and I signed it the end of August. Celebrations with family, friends, and fellow writers followed. Now I’m in the midst of one more revision to trim a few pages. In the spring, my editor and I will work on additional revisions, followed by plans for the book design and pre-publication promotion for a release in autumn 2017. Every now and then I replay Leslie’s first words in my mind, and I feel excitement and gratitude for this perfect fit. I encourage you to visit the Homebound Publications Bookstore. 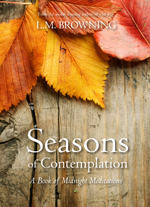 To kick off the autumn season, they’ve discounted books 20%; use the coupon code AUTUMN20 when you order. I’m honored that, soon, Hiking Naked will be part of Homebound’s collection of contemplative literature. So excited for you … does seem like a perfect fit and I await publication. Congratulations! Thanks, Cathy. Once the book is published, maybe I can offer a reading to Friends in your neck of the woods. It would be lovely to see you again. Congratulations, Iris, and thanks for sharing this information about Homebound Publications. Looking forward to reading your book. Thanks, Cynthia. I love singing the praises of Homebound Publications! Thanks, Karen. I feel blessed indeed. I appreciate your support. Me, too! Thanks, Gretchen – for your comment and your support through this long gestation! Iris – This is such fabulous news and so well-deserved. Your memoir is wonderful, and here in this post and at the start of this new relationship — with a publisher you believe in — you model the values that make Hiking Naked so moving: thoughtfulness, generosity, humility, humor, and passion. Ahh, thank you, Ana Maria. I did want this post to be as much about the process of finding a publisher and to sing the praises of Homebound Publications as to share my exciting news. Glad to hear that’s how it read to you. In you I have an outstanding teacher of thoughtfulness, generosity, humility, humor, and passion – not to mention friendship and the craft of writing.